From his very first day at Madison High School, Seth is a witness to Brian’s relentless bullying. And from the beginning he sets out to protect the bully’s victims. But when Brian starts attacking Seth’s friends, it gets personal. Then Brian learns about Seth’s gay parents. 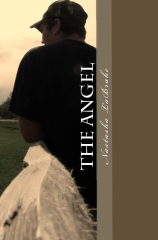 "The Angel" is self-published by the author. Add your review in comments! Self-published, eh? I will consider featuring Natasha's book in the second part of Kristine Asselin's and my "Where Are the Gay Parents in YA Lit?" Series. Awesome, guess I'll have to read this. Thanks for convincing me.